April is Oral Health month and to celebrate, we're holding a giveaway for children under 13! Good oral health should begin early – even before a child’s first teeth erupt! As a parent, you have a big role to play in keeping your child's teeth healthy and clean. Prevention starts at home, with good eating habits and daily cleaning of the teeth! We'll be giving away a bundle comprised of Oral Health products for children, a $50.00 Cineplex gift card and a $25.00 iTunes gift card! What kid wouldn't love that?! The winner will be randomly chosen at the end of the month! Good luck! 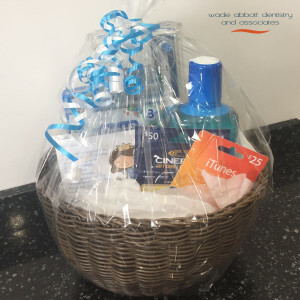 Note: eligibility depends upon visiting Wade Abbott Dentistry for an appointment in April 2018. Disclaimer: names and information will not be made public.